A MAJOR INTERNATIONAL CONFERENCE discussing climate change, hunger and poor nutrition will take place in Dublin today and tomorrow. 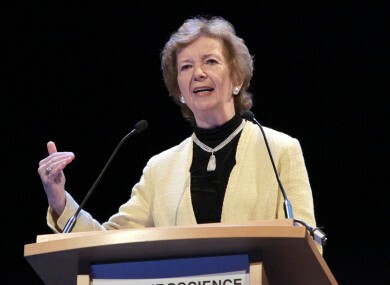 Among those attending the conference, which is hosted by the Government and the Mary Robinson Foundation, will be the former US Vice-President and climate change activist, Al Gore, as well as former Irish president Mary Robinson, Minister for Trade and Development Joe Costello, and representatives of communities in Africa, Asia and Central America living on the frontline of climate change. The two-day event, Hunger – Nutrition – Climate Justice 2013, runs today and tomorrow in Dublin Castle, and will explore the links between climate change, hunger and poor nutrition, and their impact on the world’s most vulnerable communities. It is organised in partnership with the World Food Programme, and the CGIAR research programme on climate change, agriculture and food security (CCAFS) and will be opened by President Michael D Higgins. It is being held as part of Ireland’s EU Council Presidency. Tánaiste Eamon Gilmore said that Ireland is recognised internationally for its leadership on tackling hunger in some of the world’s poorest communities, and dedicates 20 per cent of its overseas budget to this. But as climate change increases the frequency and severity of droughts and floods and makes food more difficult to produce, we need innovative solutions to support communities on the frontline. Minister Costello said the conference is an “expression of the priority the Irish Presidency places on development issues” and that it is critical that the lessons learned are taken into account in international policy discussions. Robinson said that when people are in positions of power and influence, “the most important thing they can do is listen to those they seek to help”. This conference gives voice to those most in need, and provides an essential opportunity for policy makers and leaders to listen, learn, and as a result, lead. I hope that what policy makers hear and learn at this conference can help them to play their part in shaping a new development agenda. The conference is expected to generate a number of recommendations to support vulnerable households as the world reviews the UN Millennium Development Goals. Email “Tackling climate change and hunger on agenda at major conference”. Feedback on “Tackling climate change and hunger on agenda at major conference”.